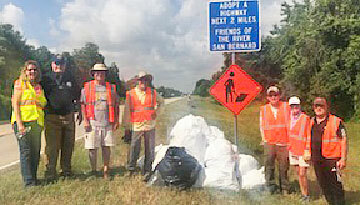 A big thank you to FOR volunteers who collected highway litter along FM 2611. 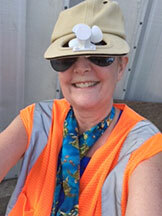 Kathy MacDonald sports a solar powered cap worn while picking up trash. Despite hot temperatures, eight FOR volunteers picked up someone’s carelessly tossed litter along a two mile stretch of FM 2611 Churchill Bridge on Sat Jun 9, 2018. Twenty-one bags of trash were filled. Volunteers included Adopt-a-Highway Chairman Mike Pudlo, Barb Pudlo, Lynette Nagler, Jack Jack Muskopf, Cathy MacDonald, Tim Logan, Jane Logan and Fred Kanter. Pct 4 Deputy Constable Glenn Whisenant from Constable Brawner’s office provided the safety alert to motorists along the pickup area. Picking up litter along this area keeps the San Bernard looking beautiful!